At Xanadu Med Spa, we believe everyone deserves to have naturally radiant skin. We offer SkinMedica® products, whose makers have dedicated years of scientific research to formulating advanced skin care products that rejuvenate skin. Your body’s natural healing and restructuring properties serve as the inspiration for all SkinMedica® products. All SkinMedica® products are formulated with anti-aging and protective ingredients such as vitamins, antioxidants, and sunscreen. SkinMedica® was founded more than a decade ago by dermatologist Dr. Richard Fitzpatrick, who wanted to make sure his patients had access to the best possible ingredients and formulations. SkinMedica® offers a complete line of extremely high-quality skin care products that utilize proven skin rejuvenators such as vitamins E and C, retinol, tea tree oil and salicylic acid. Achieve healthier, more youthful skin with the help of SkinMedica’s® superior formulations. 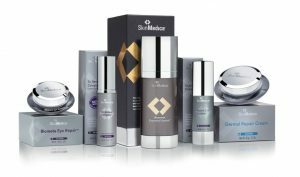 SkinMedica® products include: age defense daily care and specialty products formulated for the natural chemistry of each skin type. Beginning with a cleanser toner and moisturizer for each skin type, eye creams and uplifting eye serum, retinol complex, vitamin c, dermal repair and a fabulous sun block containing micronized zinc oxide. 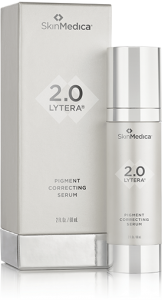 The advanced formulation of Lytera® 2.0 addresses even the most stubborn discoloration, regardless of skin type or tone. Scientifically tested in 9 clinical studies, Lytera® 2.0 has demonstrated visible correction in as early as 2 weeks with progressively dramatic results at 12 weeks and beyond. Clinically shown to work well alone as well as optimize the results of other common treatment regimens. Many things can influence your skin’s natural color. Discoloration can be caused by either external or internal factors. External factors could be sun exposure and pollution, while internal factors could be ethnicity and hormones. Hyaluronic acid is a natural, “water-loving” substance found in the skin – actin as your body’s natural hydrator. HA holds in moisture, keeping skin healthy, resilient, and supple. With age, the amount of HA in the skin decreases, diminishing your skin’s ability to remain hydrated. Between the ages of 40-50, your skin has lost 50% of the HA it had at the age of 20. Most topical HA products only hydrate the surface of the skin temporarily. HA5 is powered by VITISENSCE Technology, a SkinMedica® exclusive technology that harnesses potent antioxidants found in Vitis Flower Stem Cells and algae extracts to support skin’s ability to replenish its own HA. The result? Healthier looking skin and long-term hydration. 92% of patients rated their skin as looking healthier and more youthful, reduced the appearance of wrinkles, and enhanced skin texture and tone. 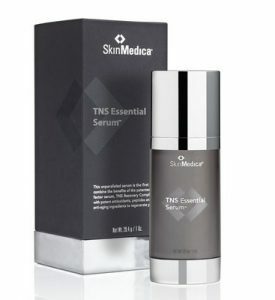 Initial results occurred in 30 days of beginning use of TNS Essential Serum with optimal results occurring in 90 days. Administered by Xanadu Skin Care Professional, the full range of superficial peels can help your complexion appear more uniform and renewed – diminishing the appearance of fine lines, wrinkles, and roughness. SkinMedica® offers a range of different strength chemical peels that licensed medical professionals can select to provide the optimum treatment for their patients. There are three different SkinMedica® Peels available. A consultation with your Xanadu licensed medical professional will help you determine which one is right for you. 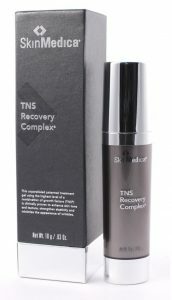 Helps provide vibrant, radiant looking skin with minimal downtime. Not for sale online. Consult with your Xanadu Licensed Medical Professionals. Peel must be administered by one of our licensed medical professionals at Xanadu Med Spa. • Noticeable results after just one peel, compelling results after three to six peels.